Five- to six-segmented shell, subcylindrical. Very small apical horn, often broken. Thorax longer than other segments. Longitudinal rows of circular pores on second and third segments. Horizontal rows on subsequent segments. Apertural margin rarely observed. Total length: 90-100µm. Thoracic length: 40µm. Thoracic width: 50µm. 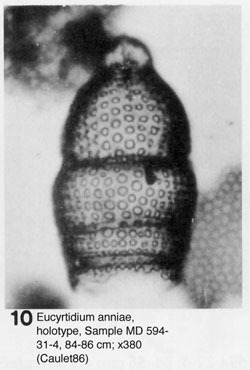 This morphotype displays numerous recemblances to E. punctatum (broad second segment, shape of the shell). It differs by the longitudinal rows on the third segment and a less cylindrical shell. E. anniae could be the ancestor of E. anomalum, as the first occurence of this species is recognized at Sample 586B-20-5,60-62cm. Close relationship seem to exist between E. punctatum, E. anniae, and E. anomalum, but the oldest species are very rare, occuring sporadically, and further examination is needed.